Foreign visitor numbers surged by 80.9 per cent in October compared with the previous month, totalling 518,477, the Viet Nam National Administration of Tourism said. The figure increased by 17.8 per cent compared with October last year. Of those, about 445,612 international visitors arrived by plane, accounting for 85.9 per cent of the total visitors; 1,500 by sea, 0.3 per cent; 71,365 by road, 13.8 per cent.this is good information for Vietnam travel agency. The number of foreign visitors to Viet Nam by air increased by 24.6 per cent in comparison with the same period last year while the number of international visitors arriving by boat and road decreased 66.7 per cent and 8.5 per cent respectively. About 314,000 international tourists came to Viet Nam for a holiday, a rise of 21.1 per cent compared with October last year. About 86,305 visitors arrived for business purposes, a decline of 0.1 per cent. In the first 10 months of the year, of a total 4.83 million international tourists to Viet Nam, 2.9 million visitors came for tourism purposes. During the same period, the country saw the highest increase from Cambodia, 56.9 per cent, followed by China, 45.8 per cent, Malaysia, 11.7 per cent and Japan 8.5 per cent. The number of foreign visitors from South Korea, Taiwan, France, Australia, the US, special Russia was also on the rise. 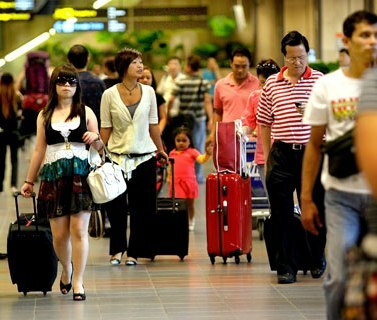 Only the number of visitors from Thailand declined (20.7 per cent) in comparison with the same period past year.